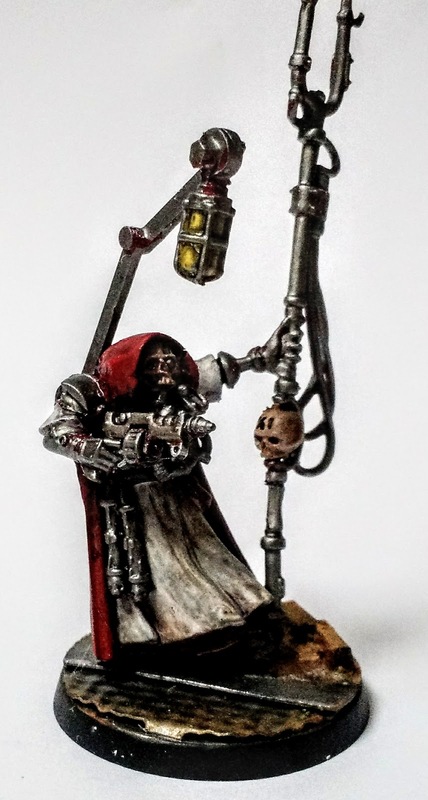 Part 5 of our review of the Inquisitional kill team of I.O. Sakhalin is his lovely killer-consort Lesya. Among the more unusual aspects of the retinue of Inquisitor Ordinary Sakhalin is his use of a killer-consort. Shown here in a traditionally effeminate kimono gown, and armed merely with two sharp blades. 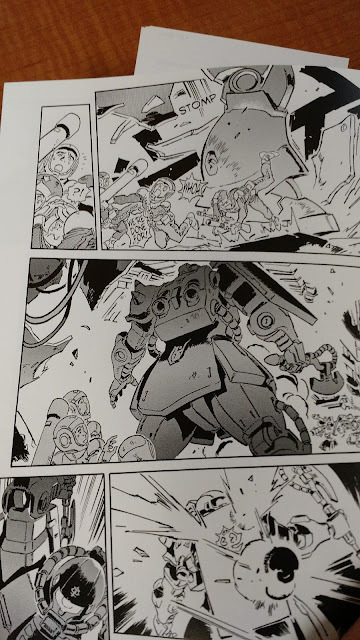 This picture must have been taken after the incident with the orkiod slavers in 430.M49, as Lesya's head has been replaced with a sensoward helmet. Those who knew her, say her beauty was only increased by the removal of her face, and her grace increased by the heavy metal replacement. A simple conversion of a Hasslefree figure. 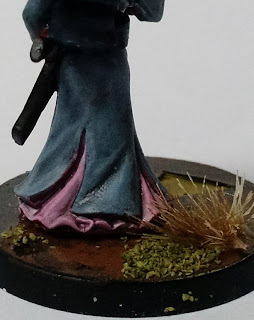 I agonized a bit on this paint job, painting a number of layers on the kimono and obi, that are, alas, not visible here. I thought about various servoskull or other options, but went with the simplest. Part four of Kill Team Sakhalin is his Allied Associate Explorator Priest Mechnikov XII. A Métoikos-Priest from Simferopol-28, Mechnikov XII is currently traveling the sector as an Explorator. As pictured here, Mechnikov XII still retains a primarily human frame, and is currently using a servo lumen to assist in exploring abandoned factorums. Also equipped with an arc-pistol of ancient design (note the lack of dorsal capacitor bank) and a shock prod suitable for biological specimen collection. 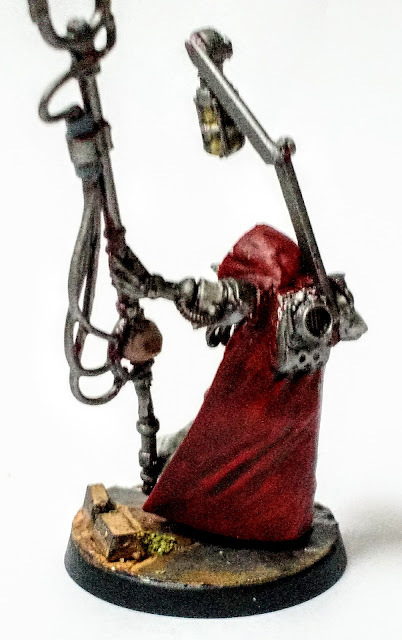 Built from a Empire wizard body and bitz, this guy took surprisingly long to come together. It was not until I had the arms from the Skittari box that it suddenly clicked and all came together. 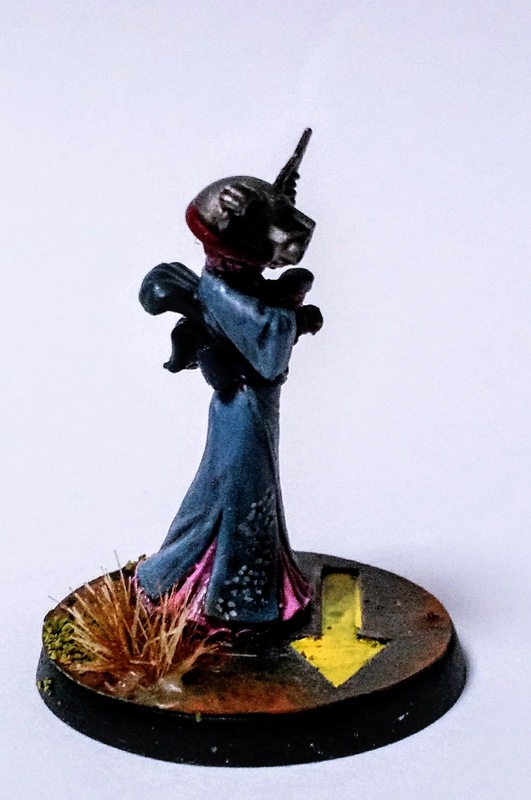 Hard to tell from the blurry photography, but I feel like his base needs a bit more work, probably with some pigment chalks to enhance the "dirt" portion. 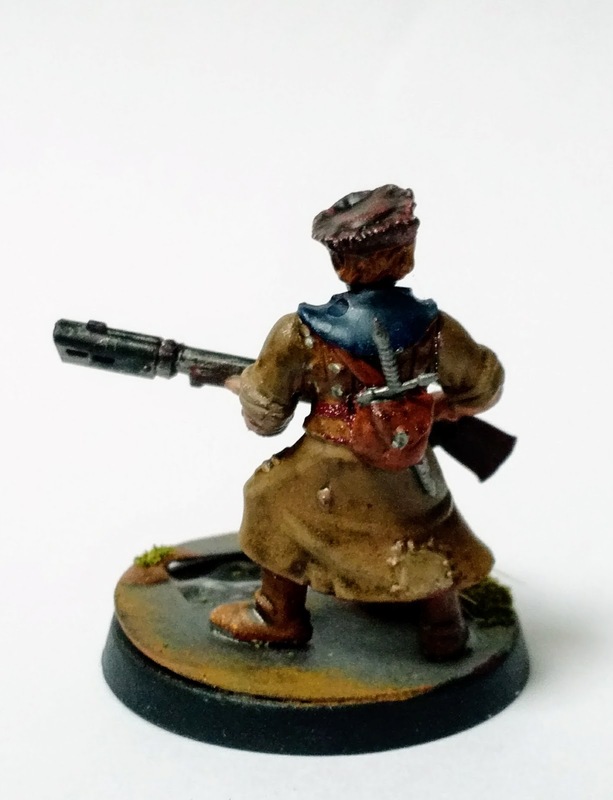 Second in our review of Inquisitorial Kill Team Sakhalin is his loyal (and young) acolyte Pasha. Unusually for an Inquisitor, I.O. Sakhalin tends to recruit his associates from his home world, as seen here with his young apprentice acolyte Pasha. Not more than a boy in this picture, he is shown wearing a light brigantine vest, and carrying a bolter rifle of local sector manufacture. Apologies for the slightly fuzzy picture, but then there is not all that much to make out on this guy anyway, as befitting an understudy. 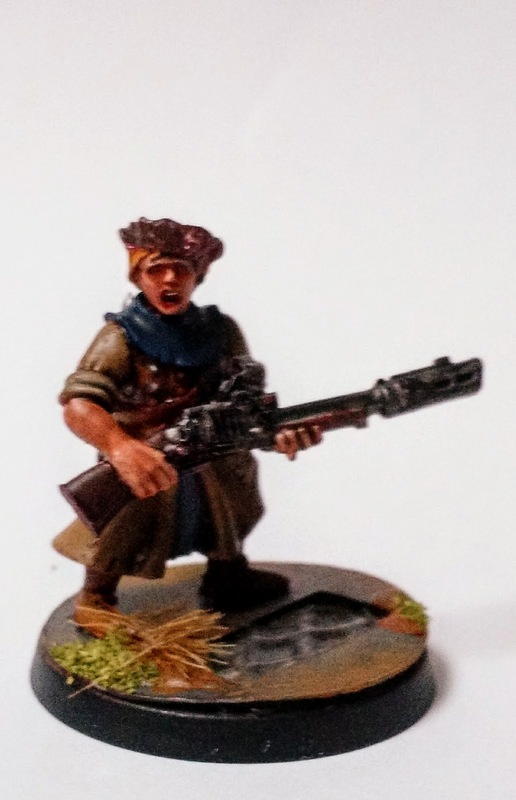 This bolter rifle I imagine to use bolt pistol ammunition, but with a better range and higher fire rate, and unusually for a converted weapon, I have another built the same way in another warband. This figure was built around 7 years ago. and completed only as part of this project. It also looks like I need to reglue the base. 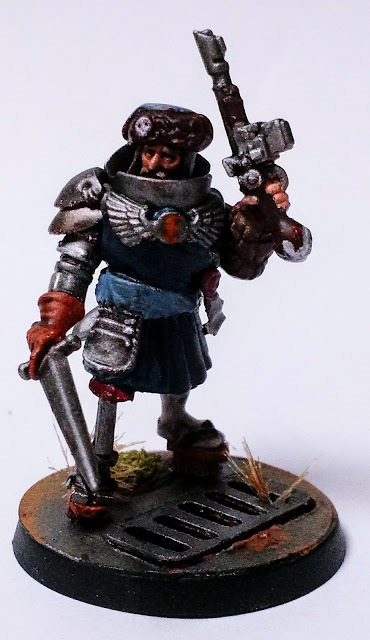 First up in our review of Inquisitorial Kill Team Sakhalin is the man himself, Inquisitor Ordinary Kazimir Sakhalin, Destroyer of Peace, of the Ordo Xenos. I.O. Sakhalin is a simple man of conservative belief, and works tirelessly to rid his sector of alien influence. He is shown here in his customary dress, with a heavy dueling las lock pistol, augmentic carapace armor, and traditional wear of his home world. Note the bionic right leg, which was fitted after it was flayed away by a Harhk sonic blaster in 431.M39. The second picture shows clearly the psyker-hood, which I.O. Sakhalin has used to protect himself from alien witches on many occasions. Not the best pictures, due to taking them with the weak light of dawn, but with some photo manipulation the colors are fairly close to where they ought to be in the first picture, which is to say mostly dark blue and steel. The figure itself was mostly built around eight years ago, and then finished a few years later when I filled in the chest plate and sculpted (poorly!) the obi and geta straps. The figure is constructed from bitz from a number of sources, as well as a scratch built bionic leg. 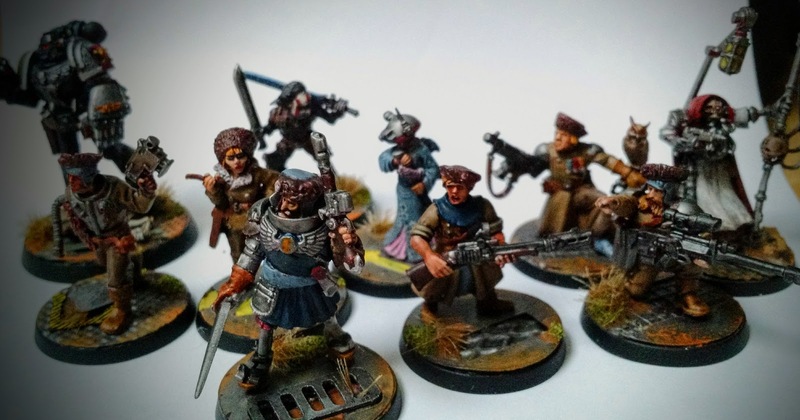 Inquisitor Ordinary Kazimir Sakhalin, of the Ordo Xenos, shown here with his usual associates. More to come as we explore each character a bit. 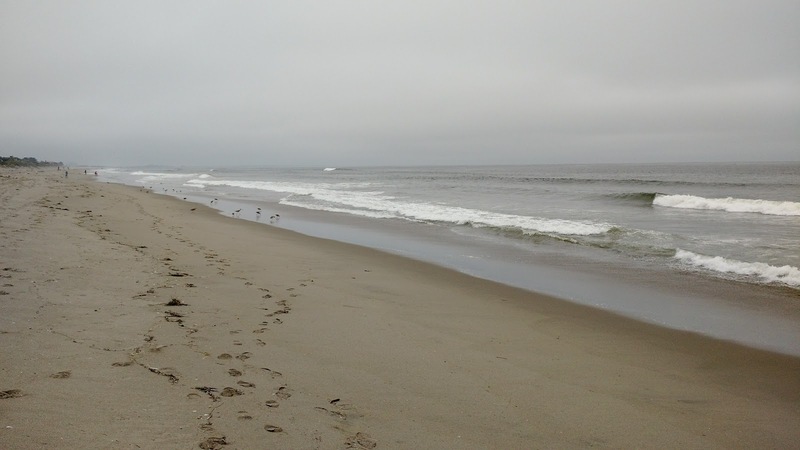 Last week we took a much needed vacation, and went to the beach for a few days, and then to the mountains to visit my wife's cousins for a few days. 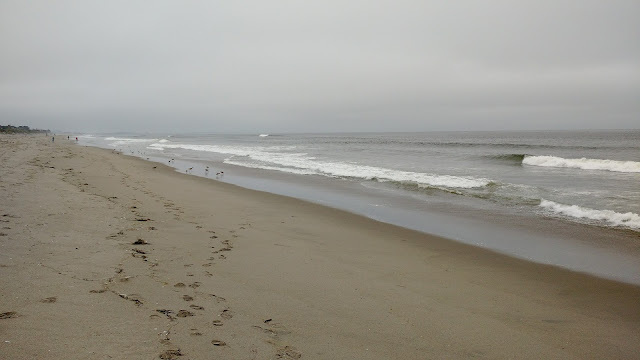 Very relaxing, although I was also reminded that shoveling sand for a day is not great for my back. 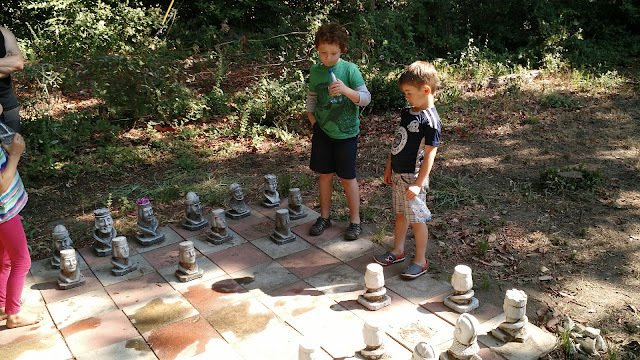 The cousins have a large outdoor chess board, and we got the kids to play a game during our languid Saturday morning. Both players performed pretty well, although they did not finish the game. Maybe next time. 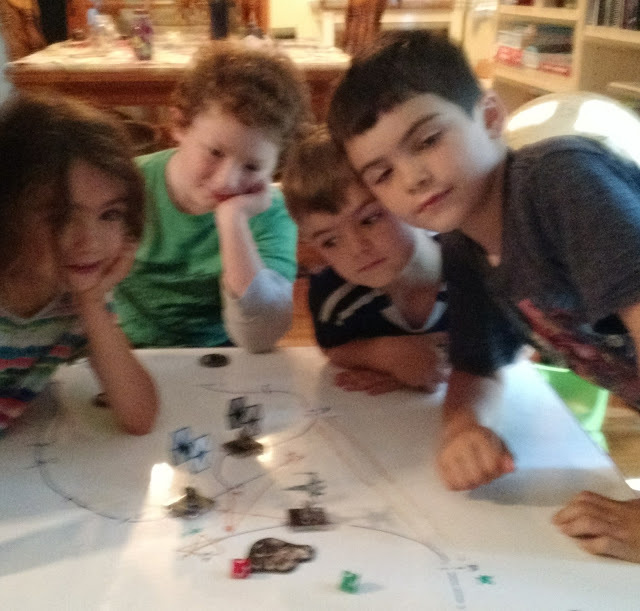 I also got the chance to teach the older kids how to play X-wing, which we played using the Force Awakens starter. We played on a whiteboard table created by one of my wife's cousins, and I marked out all the moves the kids made, and then at the end we reviewed what they did and why. Being kids, they rolled pretty hot, with at least two instances of all hits on four dice. I had all my X-wing stuff along, including a new Millennium Falcon that I got as a birthday present, but it never made it out of the box. 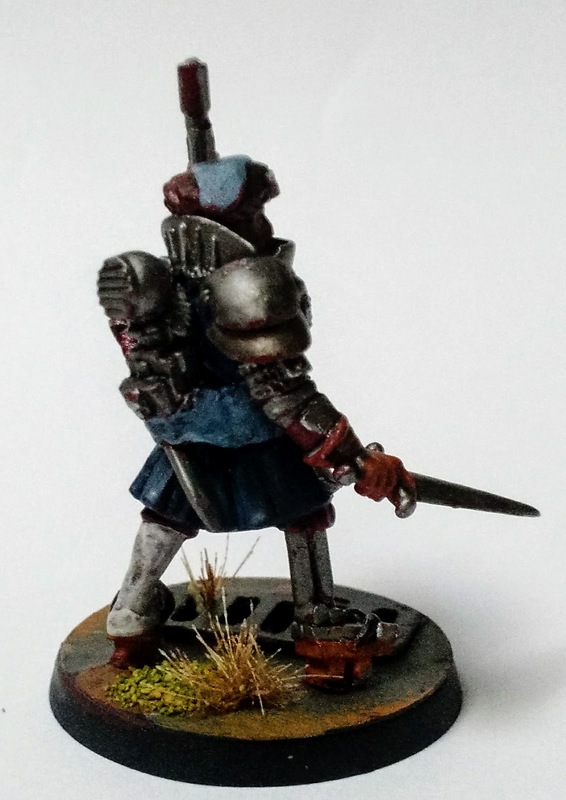 When I got back, I got a small bitz package from France, and it inspired me to actually put a figure together, and I also took a few pictures of miniatures previously painted, so hopefully this blogging lark will get back on track soon. Over the last couple years I have been slowly reading Mobile Suit Gundam: The Origin, a manga retelling of the popular animé show. 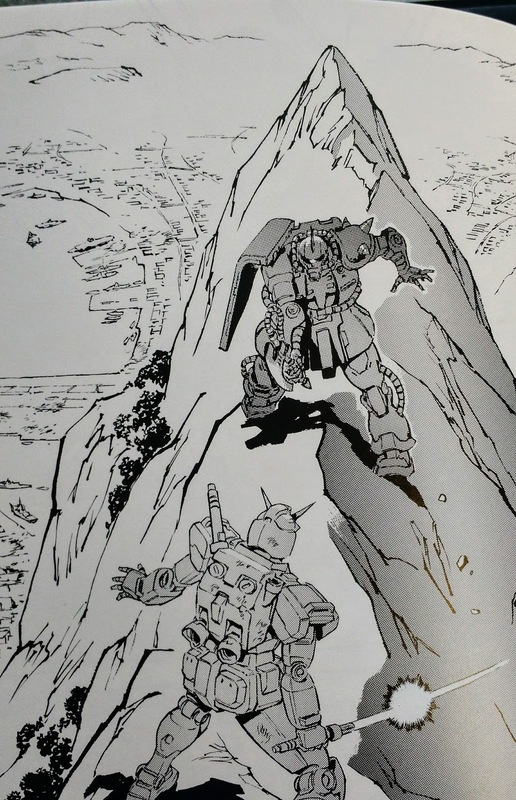 Set in the Universal Century year 0079, the story follows a now standard trope of inexperienced youths thrust into military conflict by circumstance, and then growing to excel in various roles as the war progresses (itself a type of Bildungsroman). The animé was first broadcast in 1979, and this manga was started in 2002 and is written and drawn by Yoshikazu Yasuhiko, who was the original character designer for the TV series. Rather than being a strict retelling of the TV show, The Origin adds considerable material and restructures some of the TV show events into a more plausible order. In 2013 Vertical started releasing the books here in the US in a hardback format. These are amazing books made in the aizōban style, which means that they are thick hardbacks, super high end paper, numerous color pages, and generally a limited release. 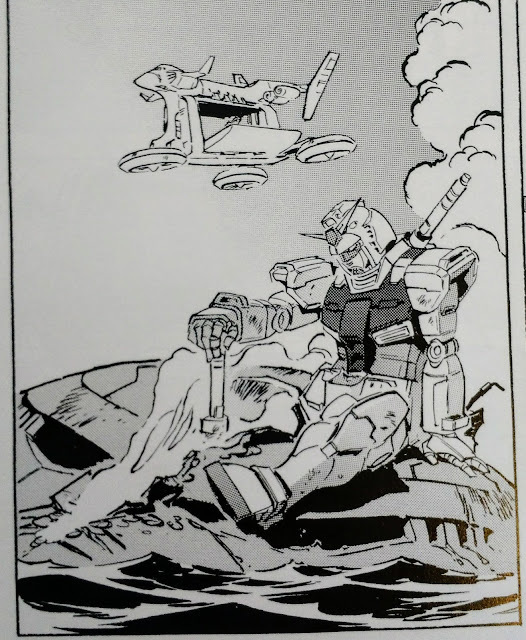 Each volume also has accompanying essays about the importance of Mobile Suit Gundam in Japanese culture or in the anime/manga industry. Ending with 12 volumes, the work is quite spectacular. Really recommend this series. 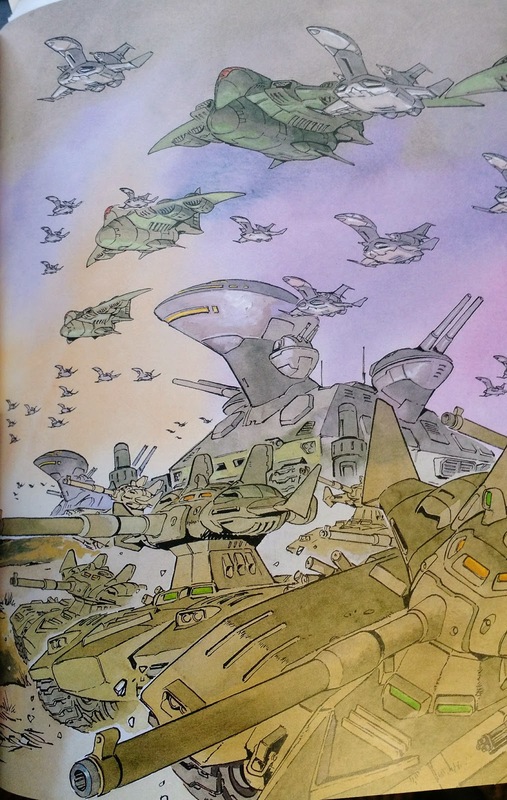 War in the Gundam universe is mainly fought by small warbands of mechs, 60 feet tall, with short range automatic tank caliber guns and close combat weapons, which are prevalent due to the hand-wavium of "Minovsky particles" which prevents such things as radar from working at all, and degrades higher frequency sensors as well. 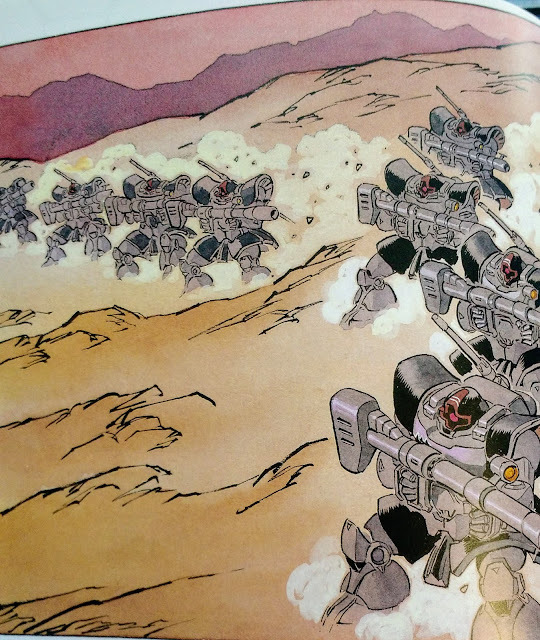 Gaming the Gundam universe is probably best suited by a set of rules that allows for detailed skirmishes between the warbands, where each Gundam is perhaps treated more like a fighter plane with pilots of different skill rather than using detailed mech rules. Since ranged fire is only for eliminating mooks and large targets, some sort of dueling skill would be needed to dice off the close combat. Tanks and infantry and so on are prevalent, but then are often mere annoyances to be swept aside with a single hit. 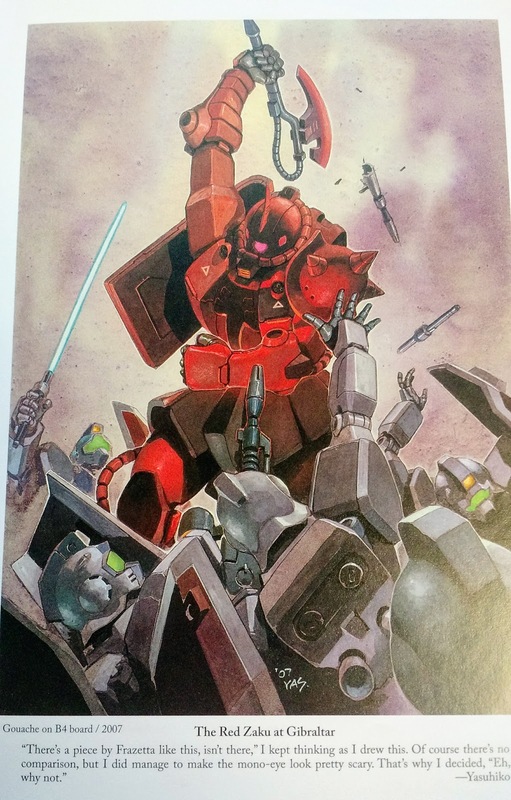 In terms of figures "Gunpla" is a huge source that can not be ignored. The term refers to the hobby of building scale models of Gundam (and other robots), and there is such a huge market in Japan (and elsewhere) for these figures that they are available for all configurations of Gundam seen on screen or page, and probably more that never were. Kits range from your standard plastic model from the early 80's to the totally poseable HG (High Grade) kits with internal skeletons, replaceable hands, and pieces molded in multiple correct colors to minimize or eliminate the need for painting. The majority of the kits are 1/144 scale, which roughly equates to N/12mm, which is a bonus given the popularity of that scale for model railroad buildings. Happily this also works well with the boom in 10mm scifi gaming, at least for terrain and civilian vehicles, if one is a purist about military vehicles. Nearly a month without a post? And that basically an advert? 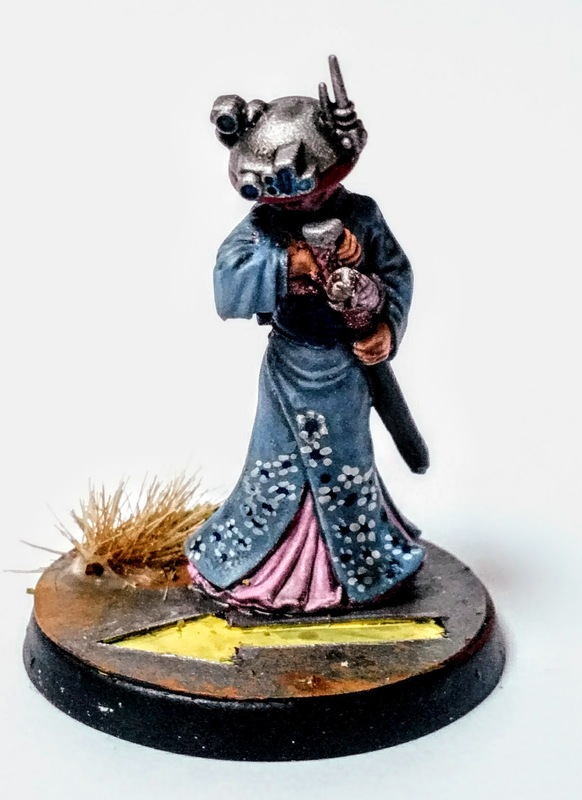 Well, between being sick, dealing with sick people, the heat (41 yesterday), holidays, kids out of school, and other malarkey, I just have not been doing much in the way of hobby. I put a brush to a miniature for all of 20 minutes in the last couple of months and it was not even that satisfying. Fortunately there are always blogs to read, and Ebay... well, maybe that last one is not so fortunate. (and strangely coupled with the former) I did contribute to my first Kickstarter, in the shape of Reaper's Bones IV, and oh dear, that is another advert isn't it? Hope to return to form soon, and I do have a few posts cooking... just not much in the way of progress.